Our riding season in northern AZ was halted for a bit earlier this spring because of forest closures due to extremely high fire danger. 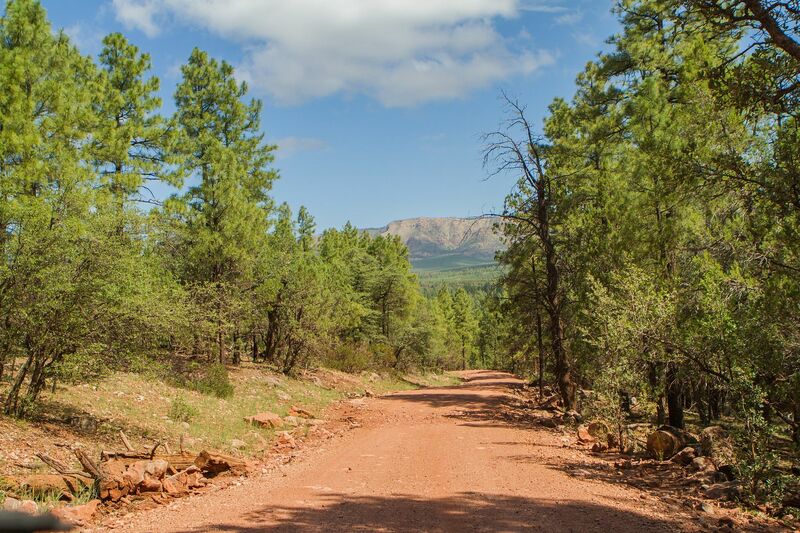 When we had a chance to get back to riding on a beautiful sunny day north of Payson, AZ, a good friend an I picked a Jeep trail near the cabin called Pyeatt Draw. 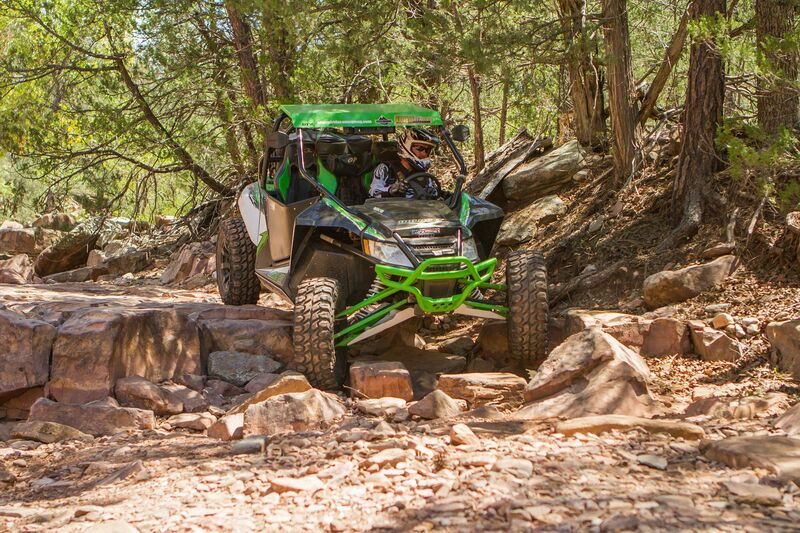 This is a really fun rock crawling trail with many ledges and boulders in a wash that makes its way through the forest. 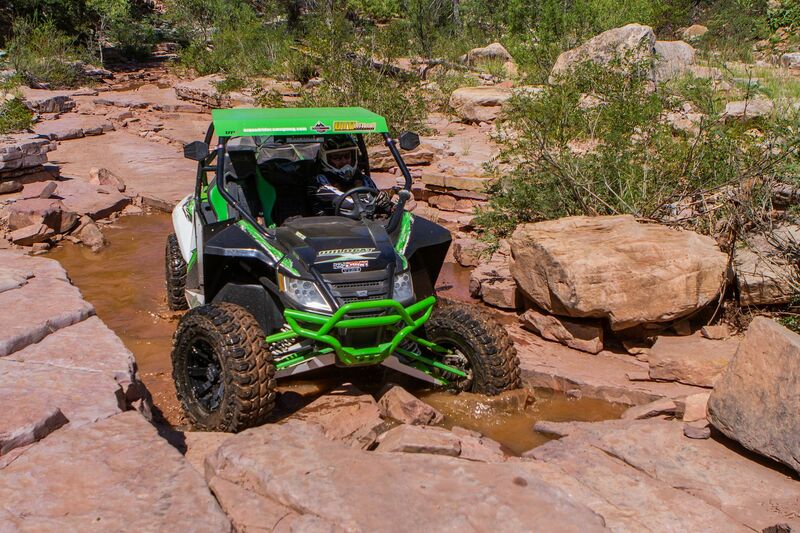 It’s always a good trail to test tires to see if they can hold up to the tough terrain. 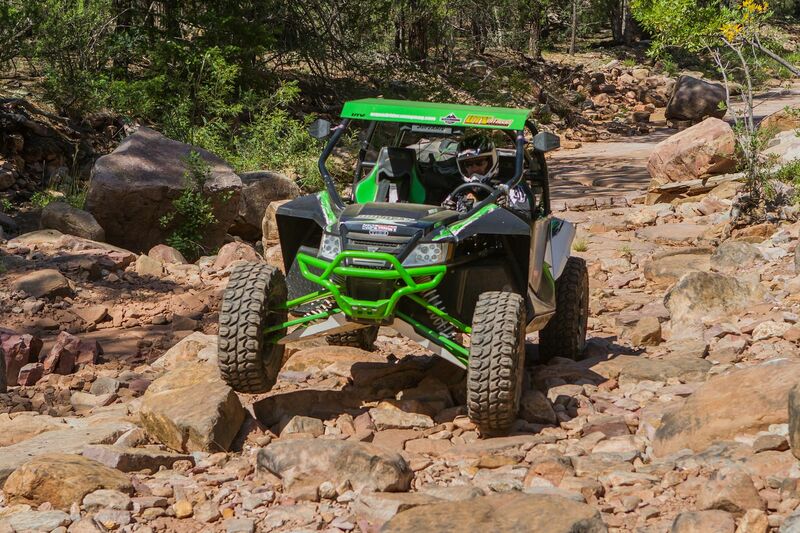 I was confident my 30/10R-14 Gladiator X-Comp tires on 14x7 Raceline wheels were up to the task. I watched a video from a couple of weeks prior where there was a flash flood that came down the canyon as a group of Jeeps were near a waterfall called the Filter, so I wanted to check it out. They were all able to get out just in time because they were paying attention and hot-footed it out of the wash at the first signs of hearing the water. The flash floods in the area have been caused by past forest fires. 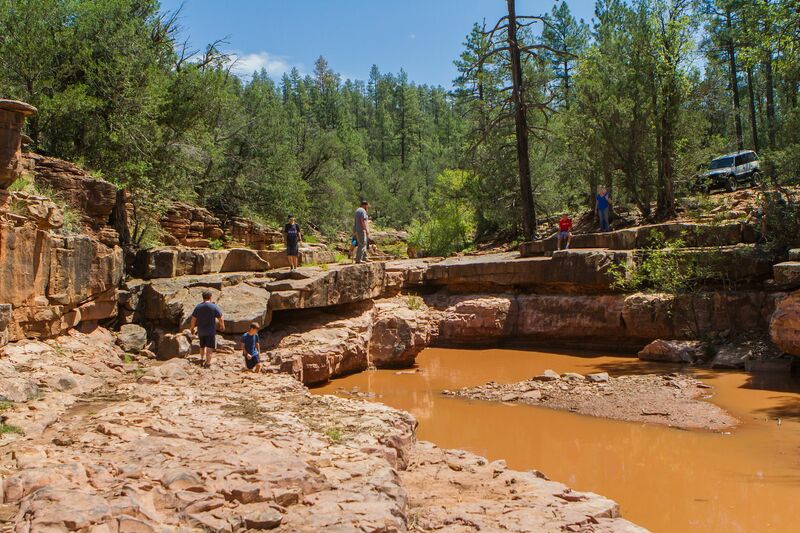 Without the vegetation, the water does not have anything to hold it back and it causes flash floods. We have had some very tragic floods in this area in the last couple of years. 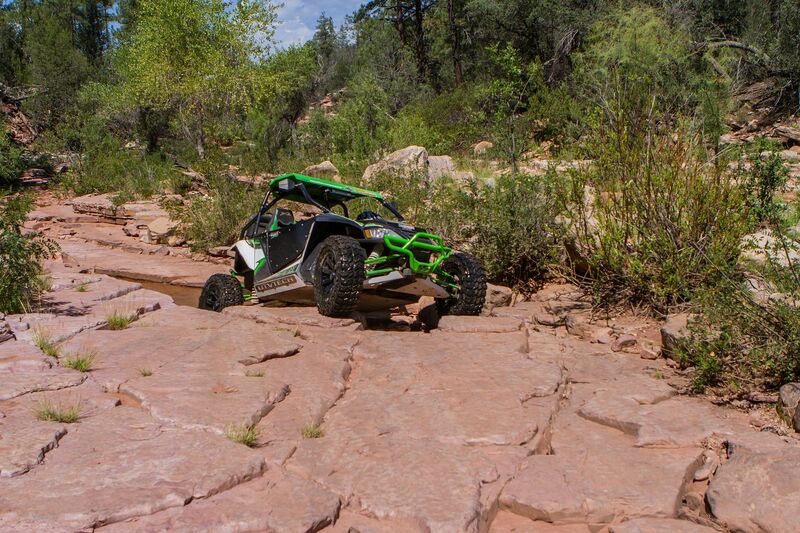 As we entered the wash there was a group of lifted Montero’s plugging up some of the first ledges so we went around them with my Wildcat X. Thankfully on trails like this, a side by side can make quick work of the smaller obstacles. As we progressed up the trail the boulders and ledges got bigger. 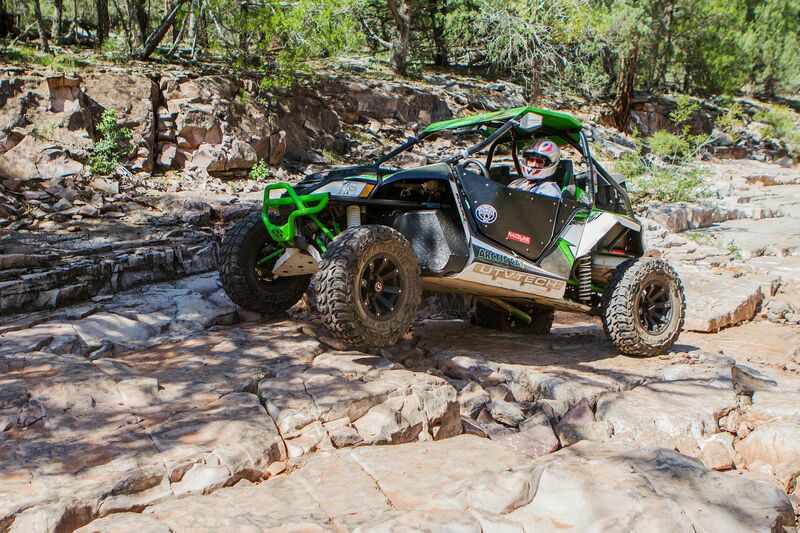 The Gladiator tires work awesome in terrain like this as they have tons of grip and with the super thick meaty sidewalls I didn’t worry about slicing one on the sharp rocks. 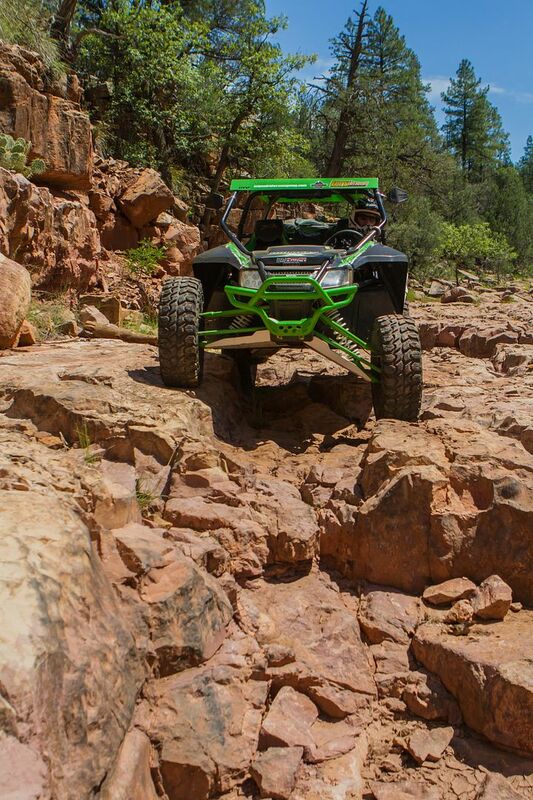 Typically when rock crawling I set my pressure with these tires at 12 PSI. My reasoning for this is from previous experience. In the past running at Sand Hollow State Park, I was running 7 PSI and found the tires had too much grip and broke things. I found at a higher PSI it lets the tires slip some but still provide excellent grip. My friend Beau drives very similar to me and also is good with a camera so we took turns hitting one obstacle after another having a blast clawing our way up the trail. Towards the top of the trail, there was a couple of bigger ledges so we got out to check out the best line. I saw what I thought was an easy line and asked Beau if he wanted to take photos or drive. I was hoping he said he would take photos because I wanted to drive. Luckily for me, he did. 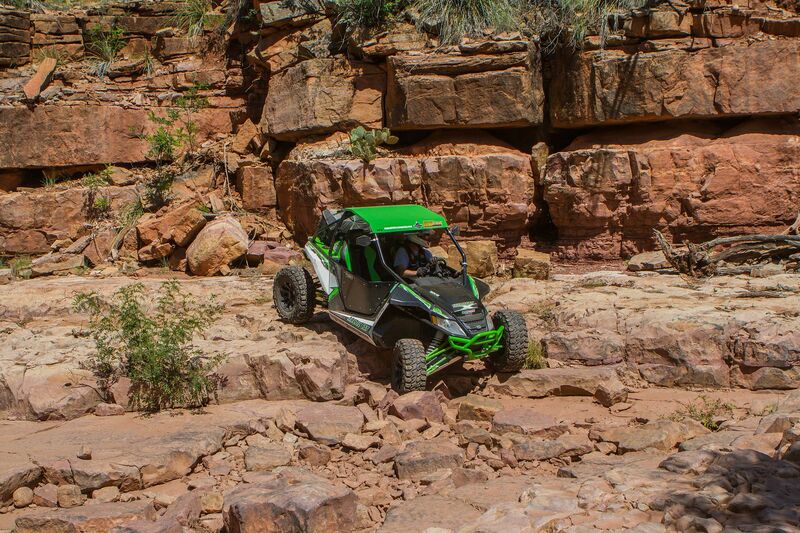 As I lined up the passenger tire climbed up a couple of ledges and just like I thought the driver side tires sidewall rubbed against the straight-up rock face and pulled the front up with ease. In fact, it jumped up to the top so fast I thought he didn’t have a chance to get any shots. Luckily he did. 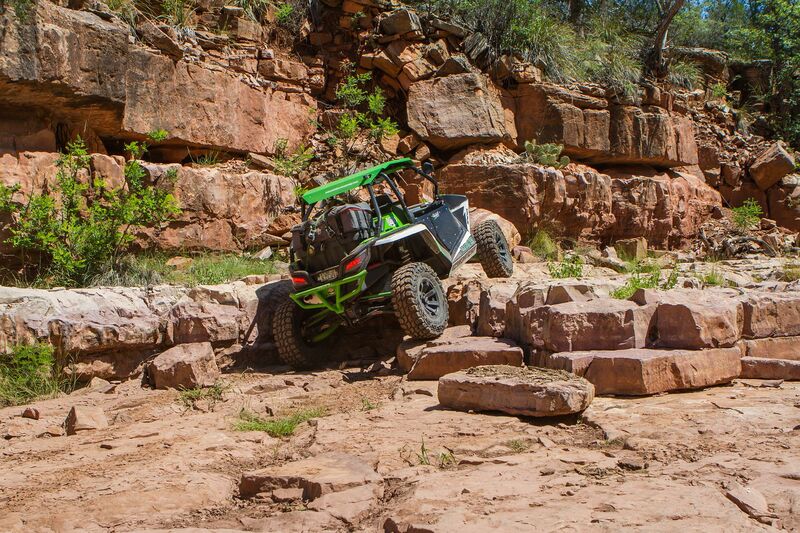 To me, rock crawling is a blast. I always look at it as your going slow, there isn’t far to fall (in most instances) and you get to see if you picked the right line or not. If not back up and try again. As we switched back there was a couple of places that had muddy water which made it interesting climbing with wet tires. 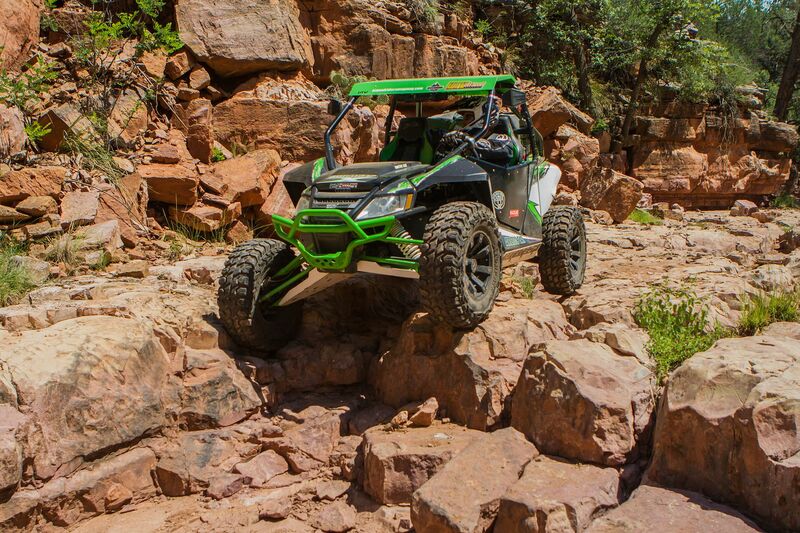 The Gladiator X-Comp tires never missed a beat and the Raceline wheels were also up to the task as they took a beating a few times but other than a few scrapes there was no damage. After a brief stop at the filter, we headed back down the trail through the rock garden for about a mile where there is an exit that takes you through the forest back to the main road. It was fun seeing the articulation of the Wildcat. As we came to the main road where we could see the mountain rim off in the distance we could see a massive cloud build-up. When I saw this I was glad we got out of there before the rain came. 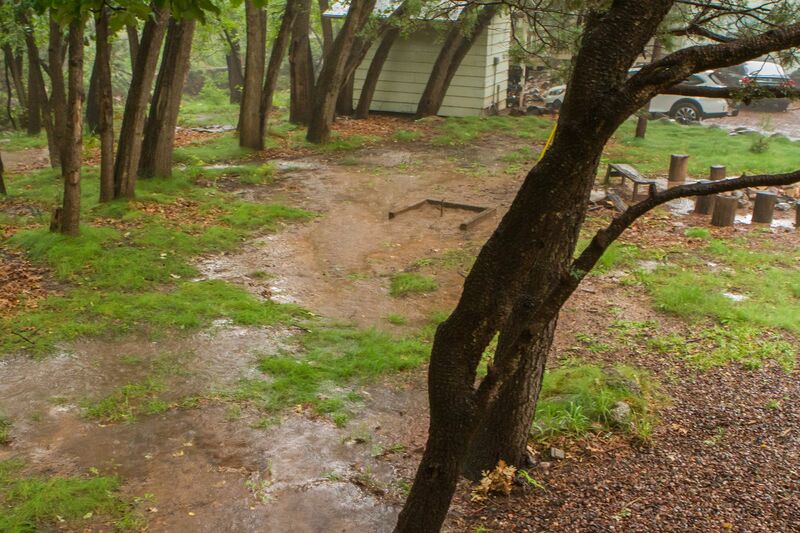 Within about an hour of getting back to the cabin, the rains came down hard for about 2 hours. I was sure glad to be sitting the deck watching instead of out in it trying to get home. 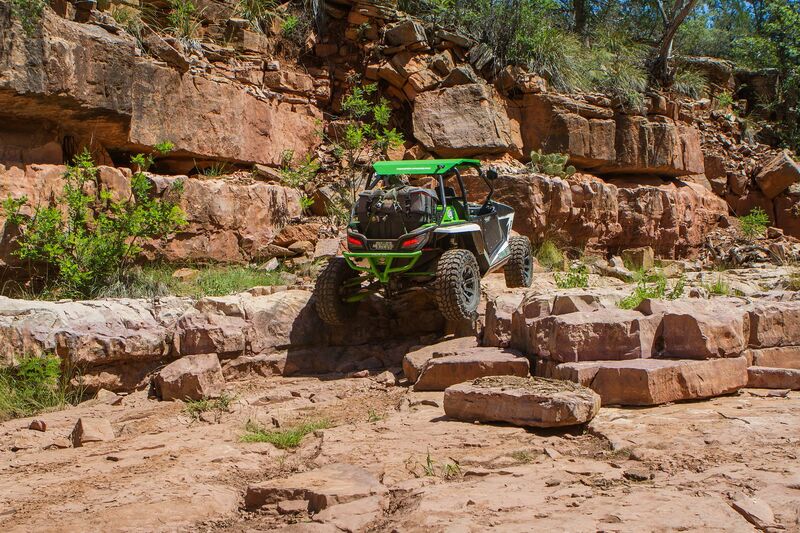 If you need a super tough tire, check out the Gladiator X-Comp ATR 10 ply rated DOT approved tire at Discount Tire Direct along with all their outstanding tire and wheel combinations for ATV's and UTV's.